Dimorphodon probably wasn’t a good flyer and didn’t eat a lot of fish. 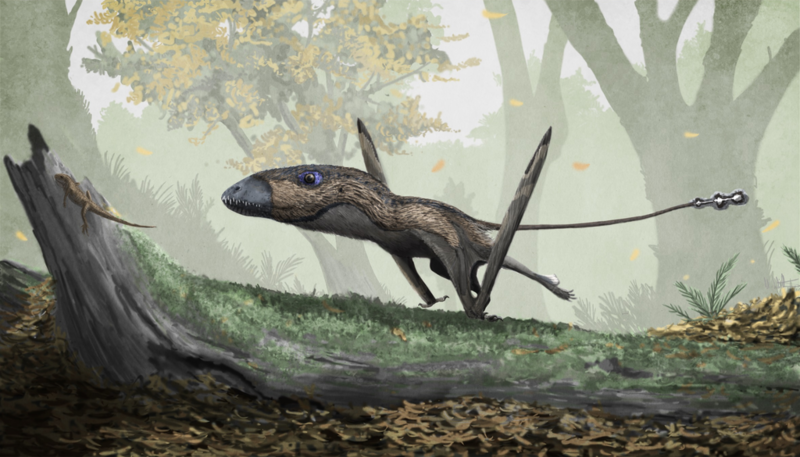 Instead, this pterosaur consumed mostly carrion and small reptiles (like this lizard). New fossil research sheds light on the diets of pterosaurs. What are pterosaurs? Read through our great activity for some help. There are no living descendants of pterosaurs. Pterosaurs were the first vertebrates to evolve independently powered flight. Their wings were a membrane of muscle and skin stretching from their ankles to their extremely elongated fourth finger. (Learn more about pterosaur flight here.) In addition to flight, pterosaurs could also waddle around on the ground (behold this gif) and even swim (learn more about that here). Pterosaurs included the largest flying animals to have ever lived. The wingspans of the smallest pterosaurs were about 250 millimeters (10 inches), while the largest spanned about 11 meters (36 feet). What do scientists think pterosaurs ate? A lot. Pterosaurs were mostly carnivores and scavengers, and had appropriately varied diets. Not a part of the study, but at least one pterosaur, Pterodaustro, was probably a filter-feeder that used its specialized “tooth comb” to consume shellfish, plankton, and algae. How did scientists conduct the new research? dental exams. Researchers analyzed 11 pterosaur tooth fossils using infinite focus microscopes to create 3D images of tooth wear. Microscopic scratches and chips create tell-tale surface textures that vary according to an animal’s diet—scratches from shellfish may be different from scratches caused by bones, for instance. comparisons to their cousins. Researchers compared the wear patterns on pterosaur teeth to wear patterns on omnivores such as bats, lizards, and crocodilians. “This is a great example of how a combination of cutting-edge techniques and careful comparisons to modern species can help us understand how long-extinct animals behaved,” says one expert.